What they say: There is a magical realm that exists alongside the human realm, but it wasn’t always so. The firsts are beings who were created to nurture the land. The world was split into two realms, and the firsts were allowed to redeem themselves. Sadly, the majority continued with their self-indulgent behaviour to the point where one of their own, a king, became so obsessed with power, he was secretly banished by the court in hopes his absence would calm the masses. But a spark of madness was ignited and not even the lost king's absence could curtail what he set in motion. What I say: As The Fallen Prince is the second book in the Keepers of Life series I suggest reading book #1 The Marked Son (book #1) first it'll help you understand the back story. In brief; Dylan has had a fairly harsh upbringing and ends up living with his grandparents. He has been dreaming of a beautiful young girl for years, and is obviously pretty shocked when he sees her whilst awake. Dylan learns that Kera is from another realm; Teag, where firsts live (they are magical people who have strong powers, known as the keepers of life). The Marked Son is about Dylan's introduction to Teag, the love story with Kera and the battle for power. 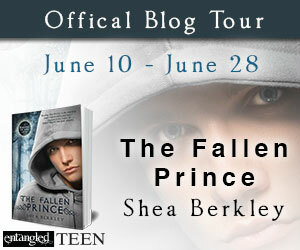 The Fallen Prince starts with Dylan and Kera living in the human realm. They are trying to come to terms with the dramatic events of book #1 and learning to control their new powers. If this wasn't enough of a problem there's also the various spiky monster attacks and the reappearance of a certain dragon! The main thing I noticed was how almost everybody seems to have an agenda when it comes to Dylan and Kera. They are continuously manipulated and used by people (from Teag). 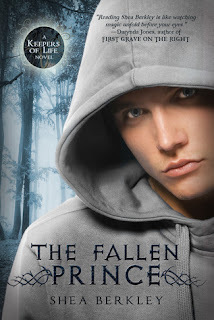 Things are getting progressively worse in Teag - Dylan is both feared and yet needed. The power balance with the firsts is off and darkness is coming...! Dylan has to work hard to control his emotions because when he gets angry or upset he risks loosing control of his powers and setting things on fire. I really respected the faith he displays in his love for Kera, and the value he sees in their relationship. It makes him seem older than 17. Even with their connection Kera can hide her feelings from him if she needs to (he hasn't mastered this skill yet) and is hurt when she does. Both Dylan and Kera's actions are motivated by their love and desire to protect the other. Kera is scared what will happen to him if he returns to Teag, so she hides various things from him. Dylan doesn't want to scare her and tries to hide his pyro problems. As with The Marked Man the secondary characters play a big part in the story and provide some brilliantly funny moments! Dylan's Grandparents are hilarious; his Grandmother has a knack of appearing and interrupting him and Kera from getting too friendly. His Grandpa enjoys soaking him with a hose (read the book and you'll see what I mean) and demonstrating his fighting skills. Cin is as wonderfully weird as ever - I seriously wouldn't want to cross her - And, oh Leo!? Without giving too much away a certain King makes an appearance (in one form or another) and has a big influence on the upcoming story. I'm very much looking forward to reading book 3! He's a delusional, mythological creature on a magic mushroom high. "I've been dragged into a parallel realm where there are talking sticks, a magical prince, and a dwarf who acts like a mood ring. Flying monkeys make perfect sense." "It is like comparing a kitten to a grown lion. Same heart, different skills, and right now you are a tangle of kittens in need of better skills."